The owner said Elandess "exceeds our expectations"
The owner of Elandess came late to yachting, but he has made up for lost time. He was 50 before he spent any significant time on a superyacht, celebrating the milestone birthday on a charter with his family. He was hooked, and in the last 16 years he and his wife have taken delivery of three custom yachts of 47 metres or more, each more finely tuned to their ever-changing lifestyle. The latest is 74.5 metre Abeking & RasmussenElandess, the closest they’ve come to yachting perfection. I join the owner on board in central London, where the yacht has sailed straight from the shipyard. He is seeing his new superyacht “dressed” for the first time and his enthusiasm and joy are palpable as he begins a tour of the boat with designer Peder Eidsgaard, Ewa Eidsgaard and her interior team, plus Abeking & Rasmussen’s project manager André Jonker. Elandess is one of that rare breed of full custom yachts that sprang from a blank sheet of paper. The profile and GA, both by Harrison Eidsgaard, were well developed before the yacht went to tender. Just how custom Elandess is would be revealed deck by deck. Eidsgaard begins the tour at the swim platform, leading us inside past the tender bay to a bright corridor illuminated from rooms beyond. The light filtering from starboard is a beckoning blue. I follow it to the Neptune lounge, which is modelled on the Nemo Room of 83.5 metre FeadshipSavannah. It is part grotto, part submarine, part amphitheatre and all completely brilliant. Its soaring three-metre-high ceiling is amplified by a wall of near full-height glass, one third of it below the waterline. Blue painted floors match the colour of the ceiling and seating, upholstered in an Extex outdoor fabric with a surprising chenille finish. The room is a showstopper; I imagine hours could be whiled away here. “I knew one other boat had attempted this,” says the owner. 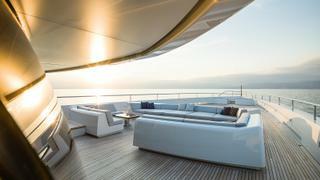 “I also knew that the yacht industry had made great strides in recent years with the use of glass. 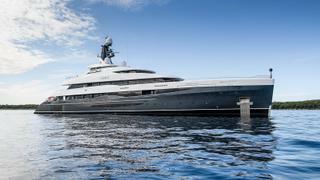 Putting all that together, we set about designing our own version of such a space – one that would be fun for youngsters and adults alike.” Catching up with the owner later at the Monaco Yacht Show after a Med season, he reveals that it “proved a huge hit with all visitors and across all ages”. This Neptune lounge is not a theatre like the Nemo lounge on Savannah (Elandess has another place for that) and her owner is right: the industry has made great strides with the use of glass. The viewing ports on Elandess are larger than Savannah’s. The six glass panels – three large and three small – delivered by GL Yachtverglasung are close to 10 centimetres thick and so strong they don’t require storm shutters. “They were so heavy we had to put them in with a crane,” Jonker says. Even the small panels, at 490 kilograms, are heavier than can be installed by hand. Opposite the Neptune lounge is a generously sized gym also utilising full-height glass offering views out to sea. Next, going aft, are a hair salon and a quiet, relaxing massage area. 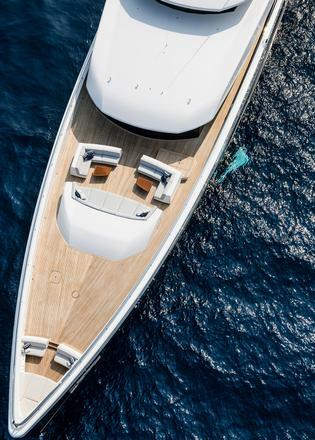 “The yard performed the engineering of the yacht and managed the approvals with Lloyd’s Register and the flag state [Cayman Islands],” notes Edmund Beckett of Burgess Technical Services, which served as the owner’s representative. “There is nothing like it in the rules,” he says of the underwater viewing lounge. “It’s not prohibited, but just not considered in the existing rules.” The yard approached the design with a thorough risk assessment that encompassed everything from how the space is treated in the freeboard calculations to considering alternative damage scenarios, which are over and above those typically required, and how any flood water may be handled in the event of a breach. 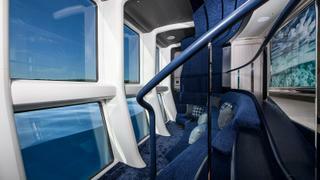 For another surprise, the Neptune lounge and gym lobby open into a glass-enclosed passage through the upper level of the engine room where guests can look into the heart of the yacht. Safety is paramount here, too, with the glass walls of the passage rated A60, meaning they could be subjected to fire for 60 minutes before degrading. A heavy door at the end of this catwalk opens on to the guest lobby, ushering us to the family suites. Here, six similar-sized cabins that can be made into three suites range off a central corridor. Pairs of cabins on port and starboard can be combined via concealed doors, while at the end of the corridor a hidden door creates a vestibule, linking the adjacent cabins. It was a layout conceived by the owners to accommodate their three grown-up children and assorted grandchildren. When the owners travel with adult friends, the beds in the rooms can be arranged as singles, as king-size beds or as an L-shaped sofa arrangement to create VIP suites, Eidsgaard notes, showing how the nightstands can be repositioned and even turned into coffee tables to facilitate different arrangements. The owners’ pleasure with the arrangement is equal to their involvement and the trajectory of their learning curve. “Once we decided to build our own yacht, since we had friends building at Heesen and De Vries, we went to visit those yards. My wife liked Heesen and they had a 47 metre available, so we signed a contract in January 2005. I had heard of Bannenberg & Rowell, so I asked them if they would do the interior and they said they would be delighted. “We happened to go aboard a 60 metre yacht at the Fort Lauderdale International Boat Show in 2006 and were surprised at how much more we could get,” the owner continues. “I met Abeking & Rasmussen and we began talking about a boat of that size. They told me that they were sorry, but they were holding a slot for a 57 metre for another client who had yet to commit, and it would be two years before they could start a boat for me. In August 2008 they took delivery of the Heesen and put it into charter service. It sold 14 months after they took delivery of their new Abeking the following year. They also began a global adventure, spending about 80 to 90 days aboard each year. “When you are on a yacht, you see a lot of things you don’t see out the window of a hotel suite.” Wanting to share that with a growing pack of grandchildren was the impetus for a larger boat. “You can’t just Google a formula for how to design a yacht for a certain number of people. You have to be involved,” says the owner. As we chat over lunch on the upper aft deck, the London skyline spread before us, the owner shares his thoughts and opinions about various aspects of the large yacht industry from his point of view as an entrepreneur, and an industry he calls “conservative, nervous and slow to innovate”. “In early 2015, Abeking came along with Peder Eidsgaard to present a speculative design for our next boat,” he says. “I didn’t like the particular design, but I liked some of his ideas and the way he worked.” Soon, the three of them were conceptualising a boat. Eidsgaard sketched a profile with a not quite plumb stem, which he calls an Atlantic bow, and a surprisingly low profile achieved by recessing the wheelhouse between the upper deck and sundeck. With a rough GA and the profile in hand, Beckett managed the bid process, which was eventually won by Abeking. With all the participants selected, the project surged forward. Key concepts were a main deck master suite, a large office and a design envelope offering multiple opportunities to be connected to the sea. “The broad-brush likes and dislikes were handled quickly and then it was off to details,” Eidsgaard says. Design meetings were scheduled in three-hour chunks. Eidsgaard and project lead Nick Houghton, Ewa Eidsgaard and designer Christopher Kvilums brought hundreds of samples to sketch meetings and found the owners so decisive, they went from first design to CAD drawings in just six intense weeks. Passing the stair column on the main deck, a curved wall upholstered in silver/white chenille fabric leads first to the owner’s office with a handsome desk of polished metal and edge-lit glass designed by Eidsgaard and made, as is most of the furniture, by Rodiek. Beyond, the master suite is a massive – and massively quiet – space that beat contracted noise levels by 10 decibels. It centres on a contemporary take on a classical raised bed. Its grey leather frame is stepped to provide integrated indirect lighting. Raising the bed gives the owners views to the horizon through the full-height glass doors to the side balcony. Milano, a silver and pale aqua fabric by Armani/Casa, sweeps decoratively up the wall behind the bed, establishing the cool tones used throughout the room. 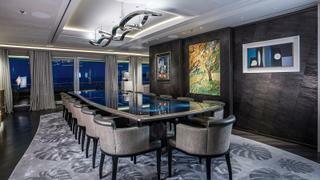 Moving aft, the main dining area is a grand affair. The centrepiece is an extending, organically shaped dining table for 14 to 20 guests, topped with Based Upon’s blue tramazite resin surface technique, with an edging of shaped pewter and polished stainless steel. The next level is where the boat gets clever. The forward part of the deck is dominated by a family space that includes a library and cosy reading nook on starboard and a large observation lounge forward with curved floor-to-ceiling windows offering views sweeping across an outdoor seating area. Sliding glass doors grant access. Unless you were looking for it, you wouldn’t notice that the overhead gets lower as it approaches the windows, or that there is a slot for a large movie screen to descend. The room is simply furnished with the largest sectional sofa Eidsgaard has ever installed on a yacht and a handsome high-top table by Hull Studio made from one slab of live edge American walnut. No, it’s not. 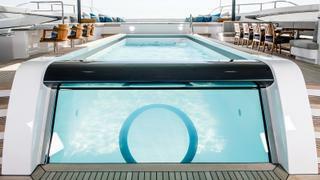 Between the sloping overhead of the observation lounge and the raised forward portion of the sundeck lies Elandess’s secret bridge, accessible only from crew circulation pathways on the port side. 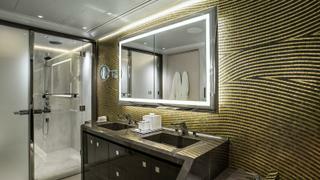 It lies between the upper and sundecks and atop the central AV equipment room, ship’s office and captain’s cabin. “Many boats this length would have another deck,” Jonker says. “But the owner loved Peder’s profile and it was our job to make it fit.” In fact, creating a central core of service areas, electrical and plumbing trunks and crew circulation is a touchstone with Eidsgaard. The owner likens the bridge to the cockpit location of a 747, although it is obviously much larger. For harbour manoeuvres, Captain Chris May points to wing stations that pop out of the superstructure, granting him unobstructed views from bow to stern. There is no obvious access to the bridge from guest areas, which keeps it a quiet and focused workspace, he says. Flanking the pool and under a hardtop is a large seating area around a dining table on starboard with an outdoor bar on port. Up a few steps and aft is a seating area that can be covered by a retractable awning. Still farther aft, sun loungers with movable backrests allow guests to face forward or aft without moving the furniture. This deck is where the children’s safety measures really come into play with stair guards and solid glass with stainless cap railings. “I think the boat exceeds our expectations,” says the owner. “She’s sleek, solid and incredibly comfortable with the variety of social spaces we set out to create. One way or another, we’ve allowed everyone to keep in touch with the elements of the sea, which, after all, is what a boat is all about. “The new Elandess is a wonderful boat into which we’ve invested all our experience and learning from her two predecessors. Together with the yard and the designers, we certainly pushed the envelope. First published in the December 2018 edition of Boat International.